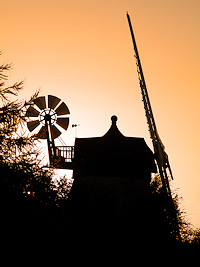 Here you will be able to find out about this historic windmill, how to visit it, its history, and its restoration. So to learn more choose one of the options from the menu to the left. 09/03/2013 - Added Newsletter 2013 to the Society page. 13/01/2013 - Added WWP Society Constitution to the Society page. 13/01/2013 - Added WWP Society Sources of Financial Support to the Society page. 12/10/2012 - Added Certificate of Food Hygiene Rating to the Society page. 23/09/2012 - Added recipes for Baking Bread with Wheatley Flour. 16/08/2012 - Added new menu item - Video Clips page. 29/07/2012 - Added new menu item - Donate page. 26/07/2012 - Added Press Cuttings to the Windmill Links page. 19/06/2012 - Added News item Instructions for installing Adobe Flash Player. 19/06/2012 - Added News item Milling Day June 2012 page. 17/06/2012 - Added News item Open Day June 2012 page. 07/06/2012 - Added News item Open Day May 2012 page. To bookmark the site either use the text below the menu buttons or save the following address: http://www.wheatleymill.co.uk/. This site is optimised for screen resolutions of 1024x768 or above, although it should be useable at 800x600. Please note that the content, pictures and site design belong to the site owners and may not be reproduced or copied without permission.